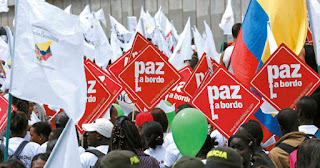 Inicio » Nosotras » Paz » Risks in the Peace Building Process in Colombia and Challenges to the new Government. Risks in the Peace Building Process in Colombia and Challenges to the new Government. More than four hundred social leaders in Colombia have been killed in the last two years in the context of peace building. During this time, Colombia became a member of the North Atlantic Treaty Organization – NATO and of The Organization for Economic Co-operation and Development – OECD. The international experience regarding the termination of army conflicts show that starting the process of reconciliation to usher in a new era is very difficult. Building trust in the process, and the ability to quickly find solutions to the structural problems that caused the war in the first place, are very important in gaining support from the population in order to build peace. With more than ten million people displaced in the last thirty years, three hundred thousand deaths, and the forced migration from rural to urban society, it is mandatory to understand that life is sacred in Colombia. In 2016, after sixty years of war in Colombia, the country finally created a peace agreement. This accord has given Colombia the possibility to start again as a society, but the implementation of it is in a precarious situation. The peace process in Colombia brings hope and the possibility to end the war in the western hemisphere by looking for one real solution for global problems such as drugs trafficking, but there are three big risks and potentially bad effects in the implementation process: One, the killing of social leaders. Two, the slow process of implementation and the new, conservative government. And three, the potential effects on Latin America, especially regarding the global drug problem. Since 2016, the year the government of Colombia and the most powerful guerrilla organization on the continent, The FARC, signed a peace agreement, an average of more than two hundred social leaders have been killed in Colombia(1). The murders of these human and environmental rights defenders and leaders of the social movement in Colombia are strictly related to the implementation of the peace accord, to the historic persecution of social movements in Colombia, and to the transition of hope of a new society. According to The United Nations, the government of Colombia is directly responsible in protecting the population, and the murders are a terrible message to society in Colombia (2). More than fifty ex-FARC guerrilla members have been killed (3). This type of situation creates a difficult environment in which to begin the peace building process. This is specially true in communities and social organizations because it requires many years for one society to recuperate from the death of more than four hundred community leaders. The second big risk of the peace process is the slow development of the new “architecture” and public institutions to build peace in the country. A very important change is that the FARC abandoned their weapons and are now a political party in Colombia, which is a grand symbol of new democracy. However, the implementation of the peace accord has not been applied to many points that were agreed upon. For example, the political participation of victims in the new Congress that was projected to start this year do not have special legislation to do so. In addition, new economic investment in places where war took place are insufficient and do no provide real support for the local communities. Likewise the newly elected president of Colombia holds a strong position against the peace agreement (4), and his political godfather and party leader is presumed to have relationships with the narcotics trafficking industry (5). It is important to understand that after sixty years of war, the governmental challenge to build peace is a complex task, and the first years of implementation of the agreement are fundamental. Third, Colombia is known to be the biggest producer of cocaine in the world. Unfortunately, the trafficking of narcotics in Latin America impacts all countries, especially Central America, the Caribbean, and Mexico. It has also had a big effect on the border with The United States. This chain reaction is associated particularly with the illegality of the drug mafias/paramilitaries and their use of violence and weapons to control the population. In many places, the paramilitaries, who sometimes work in conjunction with the governments, have been known to take the role of the government, which can lead to corruption and violence. For example, according to researchers, in Colombia “over 10,000 were killed to boost numbers for military aid in a ‘false positives’ scandal (6).” Some big businesses have benefited from the war on drugs and are working in conjunction with drug gangs, private weapons businesses, black markets, and financial speculators around the world (7). Forty years of fighting the war on drugs without success demonstrates that the world has lost this war. Young people that consume drugs in “developed” countries, and the young people that work in the illegal chains of drug trafficking such as the manufacturers, members of the private armies, and the traffickers, have been faced with social degradation and the lessening of values. The drug problem is global and its’ only solution is international cooperation. There are three solutions to address this problem. First, the government of Colombia needs to recover the monopoly of weapons and justice, and give guarantees to social leaders and organizations that are working on the peace implementation process. It is time to stop the genocide of human and environmental rights defenders and leaders of the communities. Second, all the state powers needs to work together to build powerful peace building institutions and infrastructure. This infrastructure must be a negotiation and agreement process involving all social actors in Colombia, establishing trust with a society that wants a second opportunity for peace. Likewise, it is very important that peace talks in the development of Cuba between the Government of Colombia and the ELN guerrilla ends as soon is possible (8). Third, the Colombian government needs to break the relationship between paramilitary groups/mafias and the state, and create a large social and economic presence in the country. In conclusion, in keeping a global vision, the new government should comply with the social demand for peace in Colombia, and to support the global agenda for giving economic alternatives to the producers of coca leaves, and follow the four point agreement in regards to finding solutions for the drug problem. This would be a good start to finding a global solution for putting an end to the sad history of war and desolation due to drug trafficking. * Jorge Andrés Forero-González is from Colombia and, has studied economics and political science at the National University of Colombia and the University of the Andes. He is working with indigenous peoples, the Afro-Colombian community, and agricultural communities in establishing processes for implementing the peace agreement. Right now is a Fulbright Fellow in USA in the Hubert H. Humphrey Program 2018 – 2019. ** Editing for Miranda Mosis, MAEd., Public Teacher in USA and Specialist in Education. Special Thanks. No more Criminal Death in Colombia. Documentary Nos están Matando el grito de los líderes sociales en Colombia (CC in English) With Hector Carabali of CONAFRO and CENPAZ and Feliciano Valencia of CRIC and Member Elected in the new Political Congress of Colombia.